Harrisburg, PA — Governor Tom Wolf was joined by Physician General Dr. Rachel Levine, Department of Health Secretary Dr. Karen Murphy, Department of Drug and Alcohol Programs Secretary Gary Tennis, and Department of State Secretary Pedro Cortes today to announce his administration’s new prescribing guideline recommendations for the safe and effective use of opioids. Today, Pennsylvania’s Physician General Dr. Rachel Levine presented guidelines to the State Board of Medicine, the State Board of Pharmacy, and the State Board of Dentistry. The Boards of Pharmacy and Dentistry have voted to adopt the guidelines. The Board of Medicine has voted to adopt two of the four sets of prescribing guidelines: Emergency Room and Non-Cancer Chronic Pain. The other two, Geriatric Pain and Ob-Gyn, will be voted on at a special session of the board to be scheduled sometime in August. The Pennsylvania guidelines on the use of opioids to treat chronic non cancer pain were published in 2014. These guidelines address the use of opioids for the treatment of chronic non-cancer pain. These guidelines are intended to supplement and not replace the individual prescriber’s clinical judgment. Under Governor Wolf’s leadership, the Department of Health and the Department of Drug and Alcohol Programs has convened the Safe and Effective Prescribing Practices Task Force. Membership of the task force includes various state agencies, representatives from medical associations, provider advocates, and community members. Emergency Department Pain Treatment Guidelines: To appropriately relieve pain and attempt to identify those who maybe be abusing or addicted to opioid analgesics and refer them for special assistance. Opioid Use and Safe Prescribing for Geriatric Pain: This guideline will highlight special problems concerning using opioids when treating older adults for chronic non-cancer pain. Guidelines on the Use of Opioids to Treat Chronic Non-cancer Pain: These guidelines address the use of opioids for the treatment of chronic non-cancer pain. These guidelines do not address the use of opioids for acute pain, nor do they address the use of opioids for the treatment of pain at the end-of-life. Guidelines on the Use of Opioids in a Dental Practice: These guidelines address the use of opioids for the treatment of acute dental pain. Obstetrics and Gynecology Pain Treatment: This guideline addresses the use of opioids for the treatment of pain in pregnant patients, during and immediately following delivery, and during breastfeeding. Opioid Dispensing Guidelines: These guidelines are focused on several key areas that can impact pharmacists of any practice setting. Focal points include assessing the appropriateness of opioid pain medication at the point of dispensing, recognition of “red flags” on prescriptions as well as high risk medication combinations, available resources for those with a substance use disorder, and methods to prevent diversion from the emergency department. 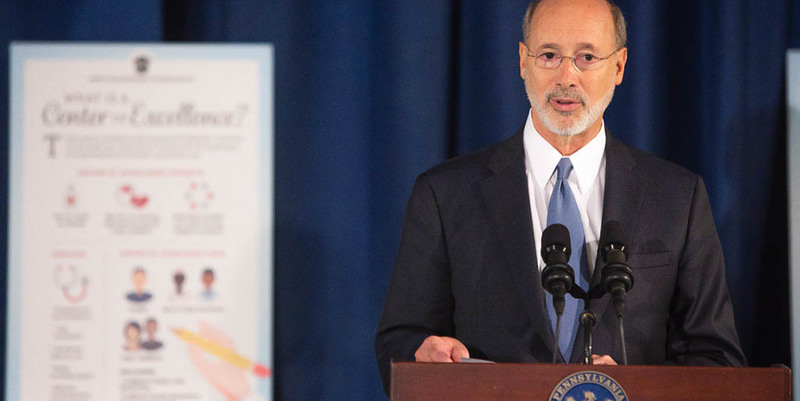 Having already secured $20.4 million in the 2016-17 budget to combat the opioid abuse and heroin use epidemic in Pennsylvania, these prescribing guidelines are another significant step by the Wolf Administration to continue the fight against addiction.